By Dan Ambrose: IBF middleweight champion David Lemieux (34-2, 31 KOs) expect IBO/WBA middleweight champion Gennady Golovkin (33-0, 30 KOs) to be really surprised by his punching power when he gets inside the ring with him on October 17th. Lemieux figures that Golovkin will be facing the hardest puncher of his career when the two of them start exchanging shots on HBO pay-per-view, and he admits that Golovkin will be the hardest puncher that he’s faced during his career. Obviously, the fight between Golovkin and Lemieux will be about more than just which of them is the hardest puncher. You’ve got to figure that boxing skills and experience will have a lot to do with the outcome of this fight. In that case, Golovkin will have a huge edge because he’s faced better opposition as a pro, and he also has a much superior amateur background than the 26-year-old Lemieux. Lemieux has the punching power to beat Golovkin, and perhaps any other middleweight in the division. Like I said, I’m not sure if Lemieux has the overall experience and boxing ability to beat Golovkin. If Lemieux isn’t able to land enough of his shots to hurt Golovkin, then this is going to be a real disaster for Lemieux. It’s already not a good thing that Lemieux is so dependent on his left hook to do most of the damage in his fights. A left hook is fairly easy to negate if a fighter has a full camp to work on negating that weapon, and Lemieux doesn’t have a very good No.2 punch as far as his right hand goes. Lemieux has decent power with his right hand, but it’s nothing special and it’s nothing that Golovkin hasn’t already seen before in his fights against the likes of Gabriel Rosado and Matthew Macklin. You can make an argument that Macklin and Rosado have better right hand power than Lemieux. The only thing that Lemieux has going for him in this fight is his left hook. He doesn’t have anything else, and he definitely doesn’t have the experience or the amateur background to pull off a huge upset like this. Lemieux is still pretty much a raw fighter that is under development. His handlers have done a good job of bringing him back from his two defeats in 2011, but Lemieux hasn’t faced anyone good yet since coming back from those losses. 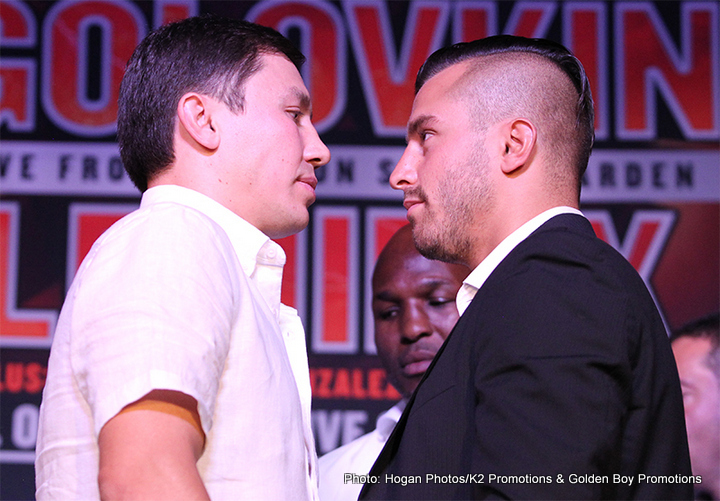 “Golovkin is a big fight, and I’m fully concentrating on this fight and not beyond it,” Lemieux said. “It’s a game of chess. Each step that you take is going to determine how you’re going to win in the end. I’m going to adapt the best way anybody else has. I think he’s a smart guy and he knows what he’s going in against. Yes, he [Golovkin] will be surprised at my power. I’m pretty sure Golovkin will be the hardest one. I can’t see in detail how it will be, but it will be massive. If you’re a coward, you get feedback as you should. If you’re a champion, you don’t duck and you play your role and you accept fights as you should then you should be considered a champion,” Lemieux said. Lemieux is going to need every trick in the book to try and land his big power shots in this fight because if he can’t deliver enough of his left hooks in this fight, it’s going to be over very quickly for him. Lemieux hasn’t been in with a puncher like Golovkin before, and he’s not going to be able to take away all his weapons. If Lemieux does take away Golovkin’s left hook, then he’ll need to deal with his right hand, which is a very good weapon as well for him. I don’t think Lemieux is going to be able to handle getting hit too many times by Lemieux’s right hand bombs without dropping for the 10 count in this fight. Lemieux has got to be one of the most confident fighters I’ve seen before. It would understandable if that confidence was packaged with an unbeaten record and some significant wins under his belt, but Lemieux has only one decent win on his resume and that was against the shaky-chinned Hasson N’Dam. Without past experience, Lemieux comes off as deluded about his own ability in my view. The kind of confidence that Lemieux has should be earned over time with a lot of great wins, but instead we don’t see that with him. All we see is a close win over N’Dam and a bunch of victories over obscure opposition. Lemieux would have lost the fight to N’Dam if he hadn’t knocked him down four times in the fight. The scores were still close at the end of the fight despite Lemieux knocking him down multiple times, and that tells me that Lemeiux was getting out-boxed in a major way in the rounds where he wasn’t scoring knockdowns. I think this is going to be a very easy fight for Golovkin if Lemieux doesn’t have some tricks up his sleeves to look better than he’s looked in his past fights, because as we saw in his win over N’Dam, Lemieux is still pretty much the same fighter that was beaten by Marco Antonio Rubio and Joachim Alcine. I saw the same tired fighter in the N’Dam fight that we saw in his losses to Rubio and Alcine. Lemieux gassed out in the same way in the second half of the N’Dam fight like he did against those guys.